Refurbishing an old Belknap Bluegrass double-headed axe that I bought for $20 at Kinzers Rough and Tumble Tractor Show flea market in Pennsylvania. 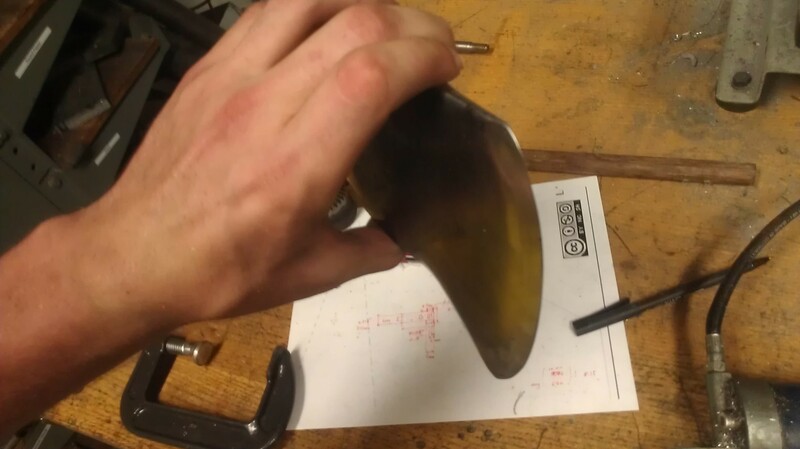 Fitting a pre-made handle (still time consuming). 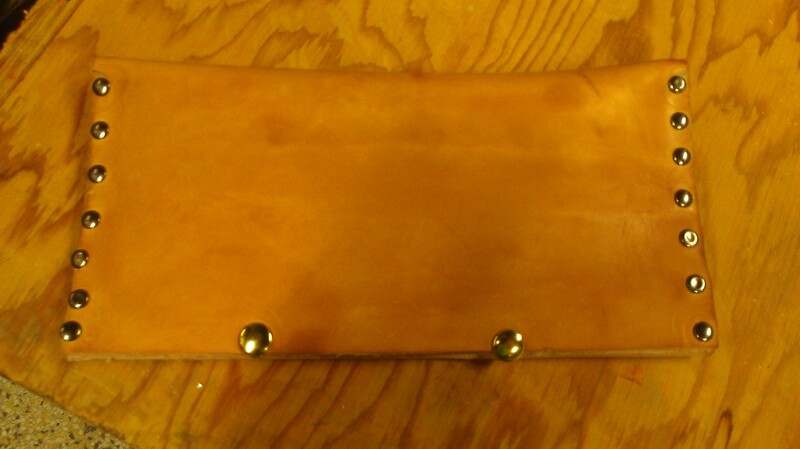 Attempting leather-working with limited leather working tools or resources. The goal of this project was to take a great $20 double headed axe that was rusty and dull. I got this double head axe from the flea market section of the Annual Rough and Tumble tractor show: http://www.roughandtumble.org/ . It had a cracking and falling apart handle with a rust all over the head, and with the axe handle loosening in the eye of the axe. 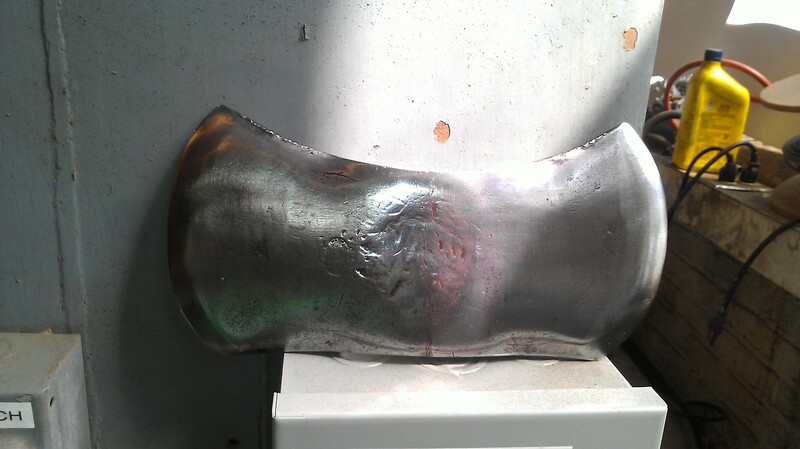 The first part of the project was to clean up the head of axe, and completely remove the handle. 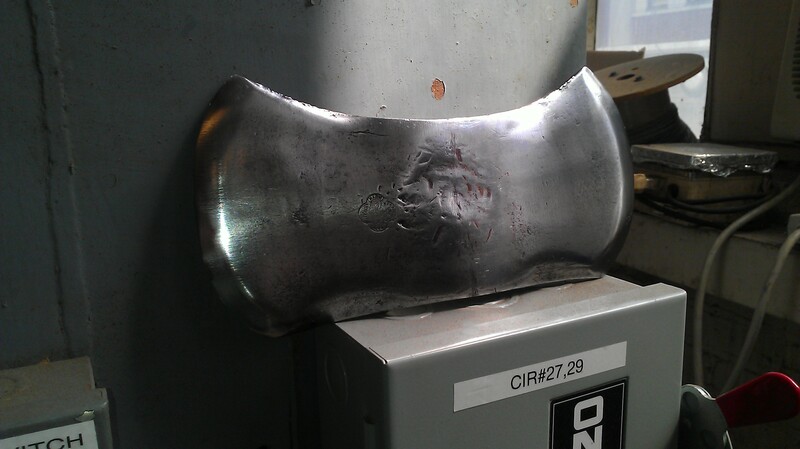 For getting rid of the handle, I initially cut off the lower half of the axe handle just under the head (~3 inches). Cutting any closer I had issues with the curve of the axe blade, where I was very likely to do damage to the steel of the axe head. So I grabbed a scrap chisel, clamped the axe head in a vice grip (With sacrificial wood as to not damage the steel) and started to remove material slowly and methodically. The reason i decided to use a scrap chisel which required me to resharpen is that I was concerned with damaging a good chisel when it would no doubt hit one of the steel wedges. 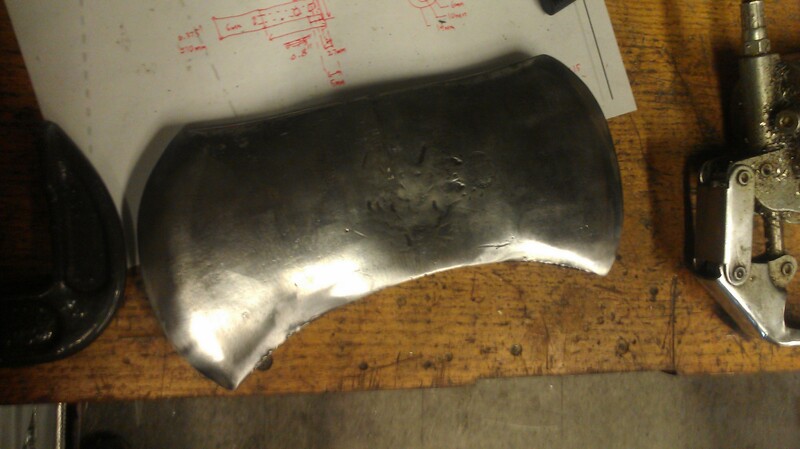 This process took a decent amount of time, but it worked with minimal damage to the axe head itself. As for the cleaning off all of the rust off of the axe head, I used a decent amount of WD-40. WD-40 is great for cleaning off rust from metal, I initially learned this trick in bike chain cleaning where you will soak the chain in WD-40 and then clean off all the gunk and rust (Note it is important to re-lubricate the chain once you get rid of all the WD-40 or it will rust again). So I wiped down the surface liberally with WD-40 and then put it in a bucket for ~30 minutes to penetrate the rust layer. Once this was done I initially wiped it down with paper towels which removed some of the lighter rust, but for the heavy duty rust i moved onto using a scotch bright pad (plain, no soap). I did this step roughly twice over before I got the surface de-rusted to my satisfaction. Once I had cleaned all the rust off I used a polishing compound and a clean shop rag to polish the faces of the double headed axe. This step is not necessary for the utility of this tool, but it sure makes it a pretty work-horse. Finally I made sure to oil the steel, if you skip this step all your hard-work will need to be repeated in a short while due to re-rusting. 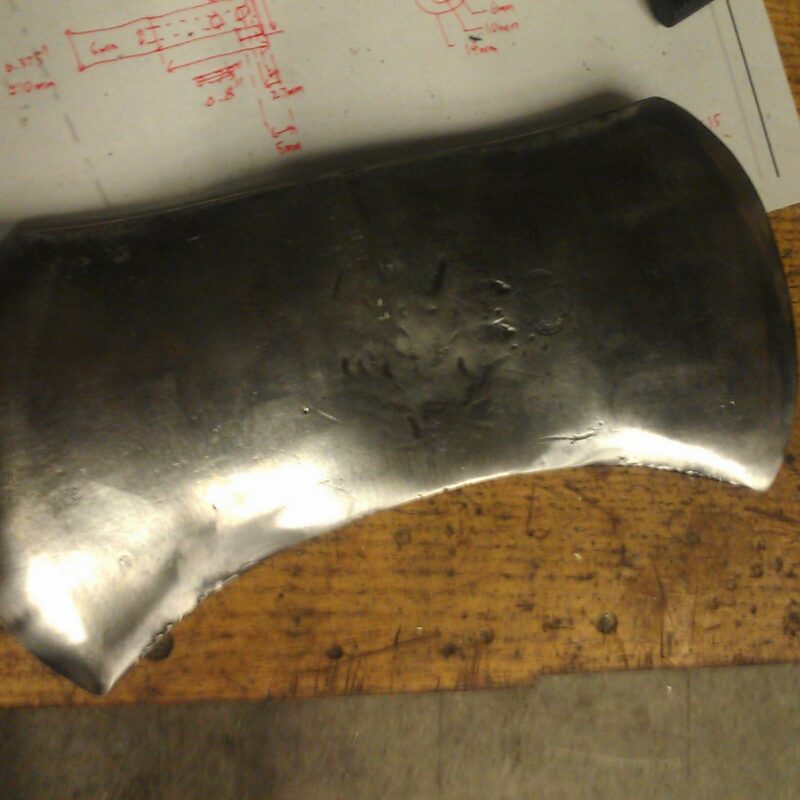 Once I had finish cleaning up the axe head, I moved onto making a handle. At first I thought it would be a fun challenge to make an axle handle from scratch… but I soon was dissuaded from that route. The issue is that (1) getting the handle shape and size done well is hard, and (2) wood type is EXTREMELY important. 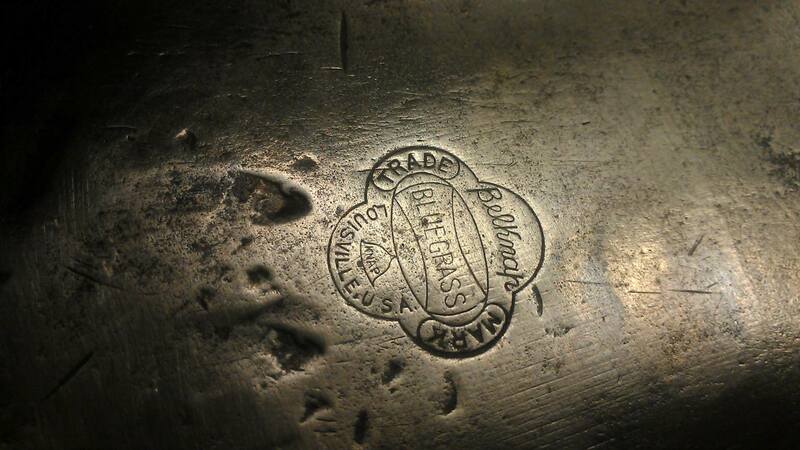 Once i had failed to make a decent handle, I went online and researched proper tool handles and axe handles. One of the reoccurring themes in these suggestions was hickory. I had done some initial research and saw some suggestions for hickory when I first went about crafting a wood handle, but didn’t really pay attention to them. So I set out to find a double head axe handle made from hickory. It took a bit of research but I found two prime candidates and bought both of them. One of them was of garbage quality, and entirely not worth using. The other was well made but coated in a thick layer of polyurethane. This was a concern for me because I had read that one great way to get a blister was to polyurethane your handles, which leads to more slippage when using it. 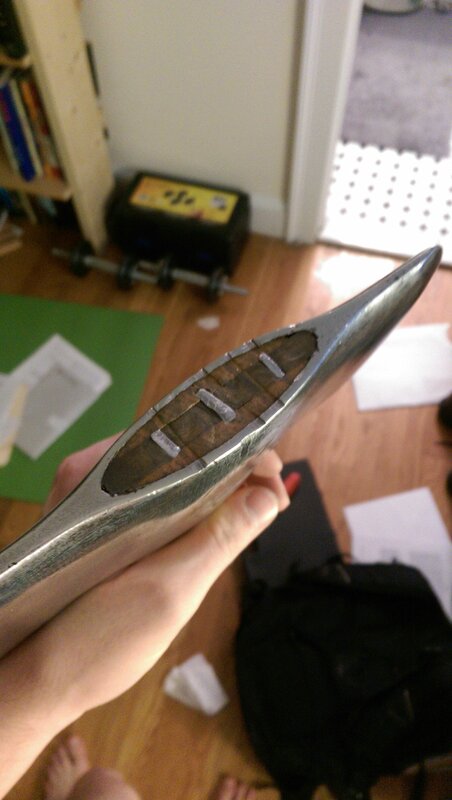 So I went about sanding down the handle completely smooth down to the wood. 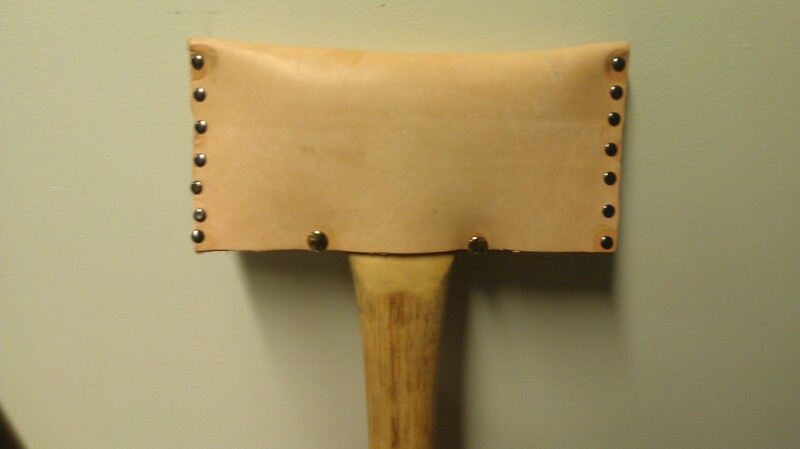 Next I took about 2 hours carefully hand sanding the head of the axe handle to fit the eye with minimal slop. 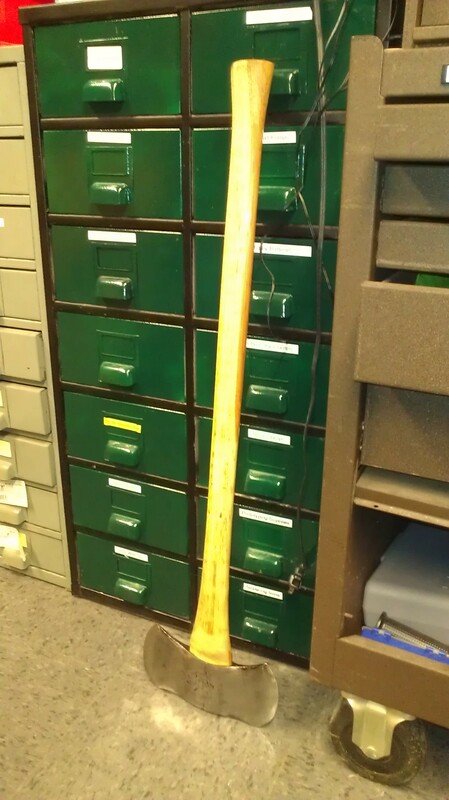 (It should be noted that axe handle was pre-slotted for a wooden wedge that it came with). Once I had it fitted, I oiled the entire handle and let it dry (I believe I did 3 coats, this was to add some finish and durability to the hickory). 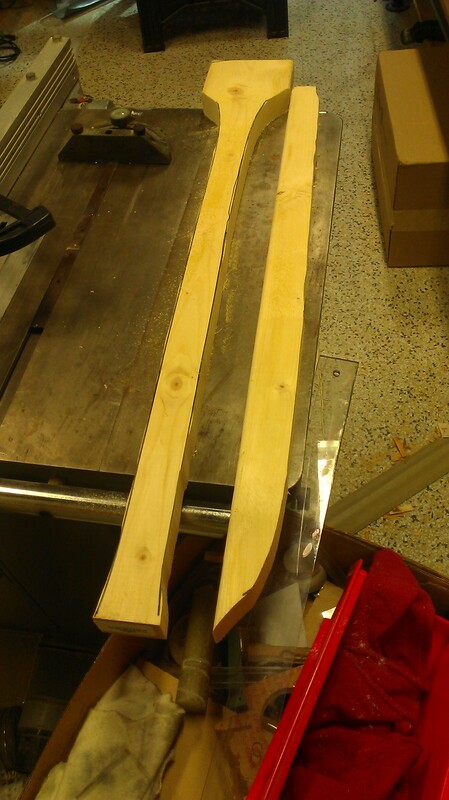 Next I used the initial wooden wedge to fit the axe head to the handle. 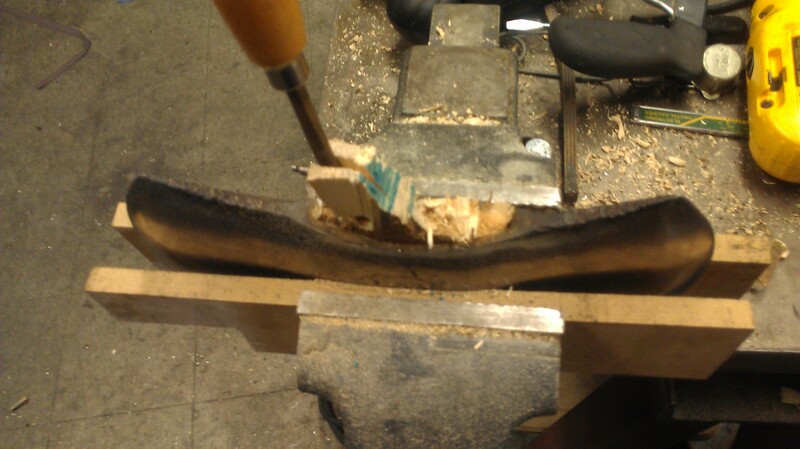 Next I used three steel wedges (2 small, 1 big) to solidify the fit. 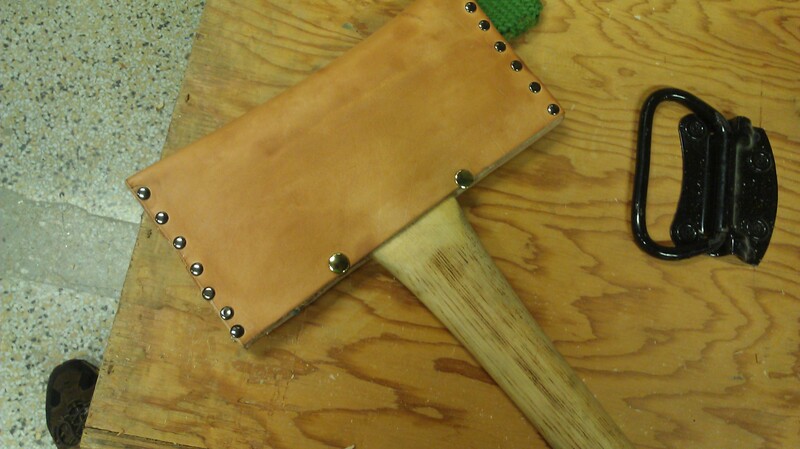 Once the axe was done, I went about making a low-quality leather double headed axe case for the head. This was mainly to protect the head as well as prevent injury during its transport and storage. In the following summer, I was able to use the axe to cut down a hickory tree of an MIT Professor/Friend of mine. Here is a link to the footage he took of me cutting the remaining 1/3rd of the tree… Hickory is tough!